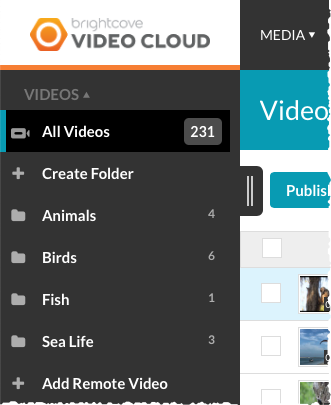 In this topic you will learn how to organize videos using folders inside of the Media module. 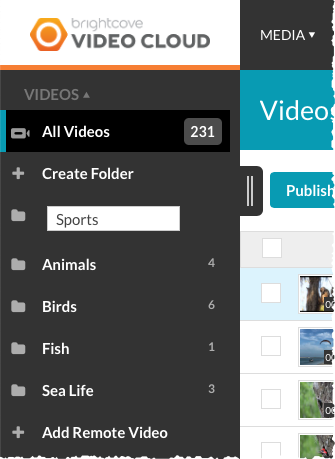 Folders can be created inside of the Media module and can be used to organize videos. You may choose to organize videos by subject, author, product, region, etc. 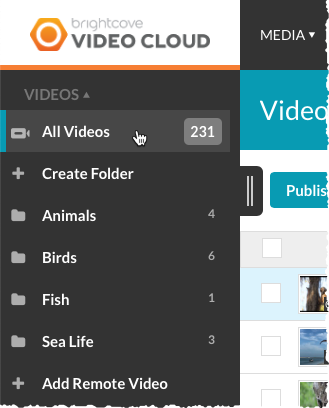 Having videos in folders makes them easier to manage in an account with hundreds or thousands of videos. Folders are displayed in the side navigation panel. The number of videos in each folder is displayed next to the folder name. Click the side navigation button to hide or show the side navigation panel. Note: Nested folders are not supported. Note: A maximum of 100 videos can be moved to a folder at the same time. 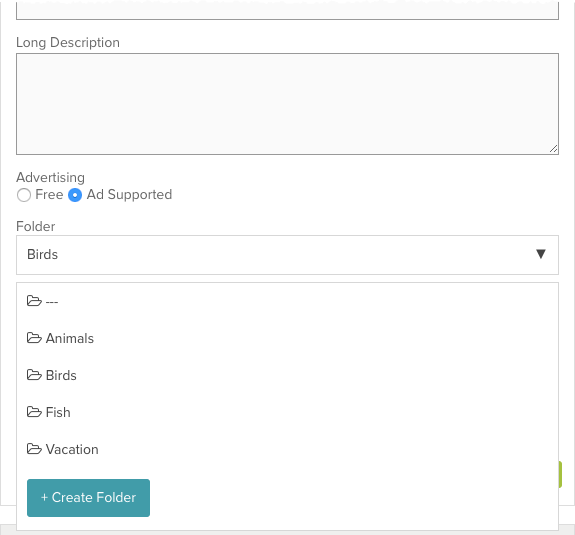 Click Create Folder in the side navigation panel. Enter a name for the folder using the following guidelines. Press enter. Note: A maximum of 1000 folders can be created. To quickly delete the folder, click the X after the folder name. Note: There is no limit to the number of videos that can be in a folder. Multiple videos at a time can be added to a folder by following these steps. In the Media module, click All Videos in the side navigation panel to display all the videos. Note: The number after the folder name indicates how many videos are in that folder. Select the videos to add to a folder by clicking the checkbox next to the video thumbnail. Click Move to Folder. Select a folder and click Move. 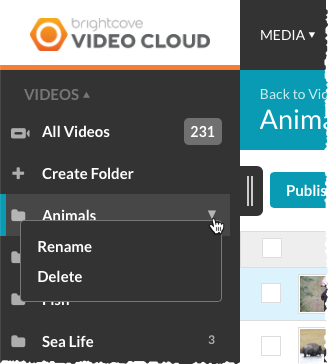 Videos can be added to a folder by editing the video properties and assigning a folder. In the Media module, click the link for the video. In the Video Information section, click Edit. Select a Folder and click Save. You can also create a new folder by clicking on +Create Folder. To view the videos in a folder, click on a folder name. You can remove multiple videos from a folder or remove a single video from a folder by editing the video properties. Multiple videos can be removed from a folder by following these steps. In the Media module, click the link for the folder. Check the checkboxes next to the videos to remove and click Remove from Folder. Videos can be removed from a folder by editing the video properties and removing the folder in the Video Information panel. Set the Folder to --- and click Save. Note that this method can also be used to select another folder to move the video to. Click the folder to be renamed or deleted. Click the down arrow next to the folder and click Rename or Delete.